Post originally published on 11/24/09 but republishing because I think it’s worth it. It’s so easy for our little ones (and even adults sometimes!) to lose sight of what the holiday season is all about. So last year, when I saw this idea on a late-night, dvr’d Oprah, I knew I wanted to use it. With a little prompting, my family tried out Holiday Notes with both sides of the family. Even though some interpreted the exchange a little differently, it was a success overall. Most have said they want to do it again, and with a little tweaking, hopefully it will become a worthwhile and cherished holiday tradition. This Quick Trick is far from quick, but it’s something that seemed to work well for us, so I thought I’d share. Holiday Notes: The idea behind Holiday Notes is that everyone takes a small amount of time to complete one of three different note cards for each member of the family. 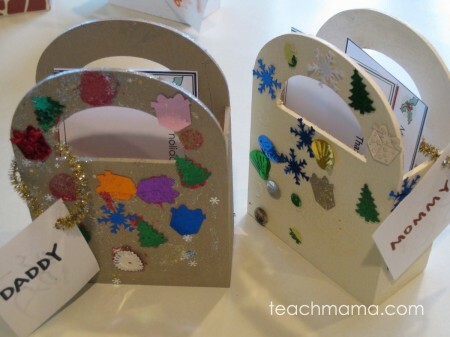 Over the holiday season–or at a holiday gathering–the notes are then delivered to each person’s special box, envelope, or bag and is read at another time. Since our immediate family presented both sides of our extended family with the idea, we made special Holiday Note Card boxes for each person–as our small gift. 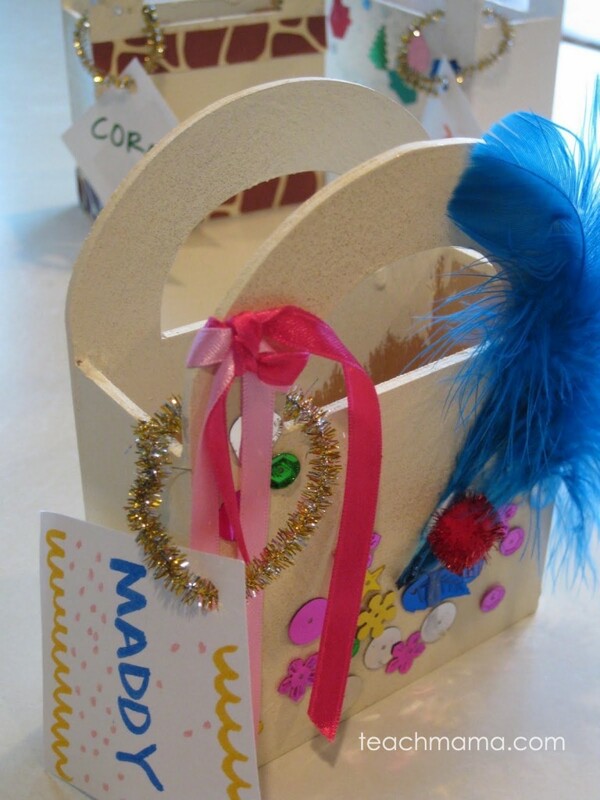 I picked up the small wooden favor bags at the craft store, and each maybe cost a dollar. Then over the course of two or three weeks, Maddy, Owen, Cora, and I worked on the bags. First we painted all of them. Then we glitzed, beautified, and decorated. We added bows, glitter (glitter glue is easiest! ), sparkles, ribbon, sequins, feathers, and anything we wanted, trying to make each one special for every person in our family. After everything was dried, we added appropriate name tags. Then we sat down together and wrote short messages. And I mean short. 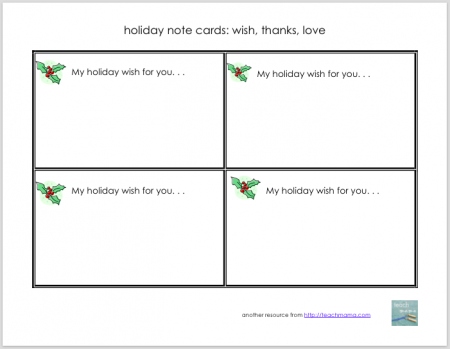 The three Holiday Note Cards each begin a sentence, and the note cards are tiny. All our personal messages do is complete the sentence. One note begins, What I love about you. . . The other is My holiday wish for you. . . , and the last one is Thank you for. . .
Sure, some notes were longer than others. Some messages turned out to be completely hysterical, and others were more sentimental. Some were really long, and others were just one sentence. Maddy and Owen (as a 4 and 3-year-old) were very excited about what we were doing. As we worked on the bags, I’d ask them what they wanted to thank their Nanny for or what they wished for their sweet cousin. I was often surprised at what they remembered (Maddy wanted to thank her Great Grandma for letting her “ice” her own bagels with cream cheese, and Owen loved his Great Grandma’s great big loud laugh and wished that his Nana’s cats weren’t always hiding around her house). We wrote Cora’s for her because she was so young, but no one was too young to appreciate reading the notes that were written to them. We read them over and over and over. My husband and I both read and re-read our own notes from family members. Sometimes even a short note–one or two sentences–can mean so much. We’ll do these notes every year as an immediate family, and maybe the tradition will continue for a few years with our extended family–or maybe this will be the last year. It can become a lot to do when there are many people involved. But for us, the act of sitting down together, really thinking about what we are thankful for, what we wish for for our loved ones, and what we love about them is what the holidays are all about. Toys will come and go, but these notes–and the bonds they will help to create–we hope will last for years and years and years and years. Happy Holidays! target inner circle: holiday. families. giving. 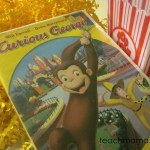 holiday traditions: curious george holiday spectacular! This is so sweet! I can always count on you for fabulous ideas! Thanks for another great one that we will be starting this year thanks to you! 🙂 Have a wonderful Thanksgiving! Love this! What a great tradition! I really like the idea! 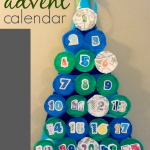 Our family is too far away, but I like the cards for Advent calendar. Your card boxes are pretty awesome too. I love this idea. I am wanting to start celebrating Yule as well as Christmas and was having a hard time figuring out how to distinquish the 2. 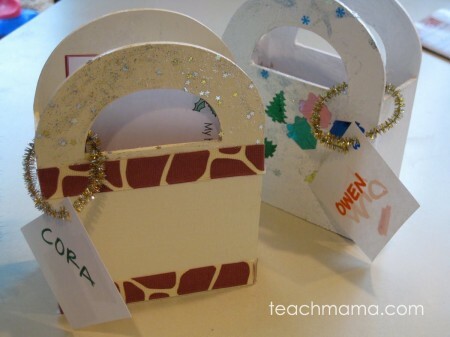 This is a wonderful idea for me to make Yule special. Such a lovely idea, even more special because all of your family was involved. What a beautiful tradition. thanks, friends–let me know if you try it out this year! WOW… just discovered you and love your endless amount of information. I'll be adding a badge… take care. Looking forward to my next stop here. I really really love this idea! I really think my family will too! I think I'm going to surprise them all on Christmas with it. You are right, the notes will not be forgotten. Every year for as long as I can remember my mom has written each of us a letter and put it in our Christmas stocking (when we were little it was from Santa). It tells of our accomplishments of the year, how much she loves us, how much we've grown, etc. To this day the letter is the first thing we look for when we get together on Christmas. I have saved many of mine and they are very special to all of us. I think your notes could be special in the same way as every member of the family would get them from everyone.